Philosophy 3 in 1 Shampoo, Shower Gel & Bubble Bath | £14 // I've wanted to try Philosophy's shower gels since I started blogging and so many people have raved about them, but the £14 price tag put me off. I saw this set of minis around Christmas time last year and thought it was a great way of trying the different scents at a cheaper price. Although it's not available anymore, two of the scents still are and I'm sure they'll offer a similar set again this year. I love the simple packaging, especially these minis with the flip open lids. I also love how each has a recipe on the front to match the scent. By following the simple steps, I am able to make melon daiquiris, vanilla cake and raspberry sorbet. These are described as a three in one product and can be used as a shower gel, bubble bath and shampoo. Personally, with my incredibly dry, irritated and sensitive scalp, I haven't even thought about trying them as a shampoo as I know it'll only set off my eczema. I've enjoyed using them as a shower gel more than a bubble bath, simply because you need to use a lot of it when using it as a bubble bath. They do create a huge amount of bubbles though and it's nice to be able to use a bubble bath and shower gel with the same scent. My favourite scent out of the three is without a doubt melon daiquiri. I love watermelon scented products and this is one of the best. I like the other two scents but vanilla birthday cake is a bit too sickly sweet and raspberry sorbet smells a bit too soapy and not very fruity. Considering the price, I expect the quality of the scents to match and with these two they just don't. Melon daiquiri definitely does. Now that I've tried them and once I finish these mini bottles, I probably wouldn't buy a full size and instead buy a gift set again. 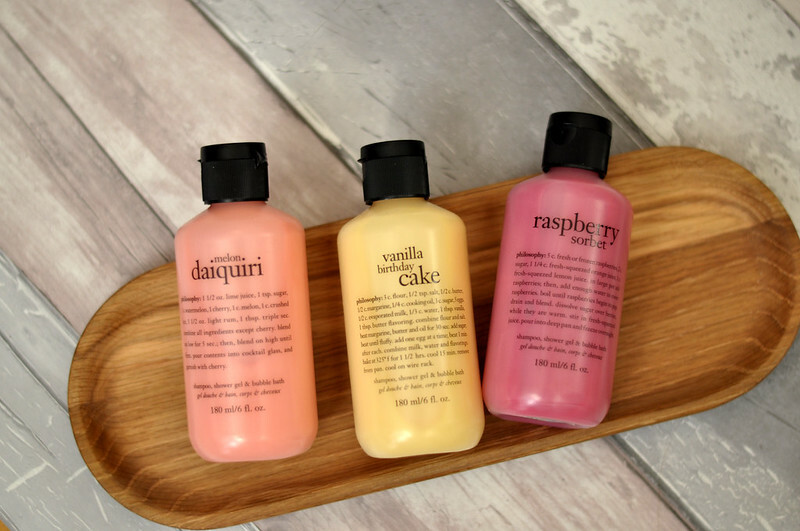 The Melon Daiquiri one is my favourite shower gel ever! I love buying the gift sets in order to trial products out. I havent tried anything by Philosophy either but I'll have to keep an eye out for the sets this Christmas to give some bits a try! Fancy a read? Check out my latest post The Glamour Summer Edit from Latest in Beauty.